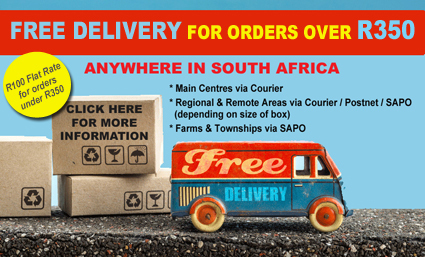 We offer free delivery for orders over R350. This does not include wholesale orders. * Volumetric Weight refers to the size of the box the order is packed into. To find out if your area is Major, Regional or Remote, you can download this 6.8mb PDF document to check. SENDING A GIFT? If your order is for a gift recipient and you would like us to gift wrap it, please choose that option when adding the item to the cart. All gift wrap items will be sent with an accompanying note from the sender and there will be no mention of The Toy Factory Shop on the paper work or packaging. Payments can either be done via Direct Deposit or EFT into our bank account, or you may use the PayU payment gateway for all types of payments. For Direct Deposit or EFT, we will only despatch the order once the monies are reflecting in our bank account.